With the horror film festival market growing in the UK it may be of surprise to some of you that The Darkside Magazine (available at all good newsagents or just subscribe HERE) have their own festival. 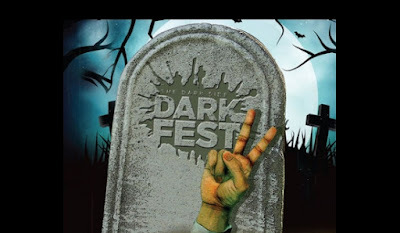 Now in its second year, this years DARKFEST festival, appropriately named DARKFEST 2 has an excellent line-up and of course guests will be attendance as well. PLUS they will be launching the latest Dark Side book British Horror Films - Beyond Hammer And Amicus, the third in the great Ghoulish trilogy. DRACULA (1958), HORROR HOSPITAL (1973), CARRY ON SCREAMING (1966) and WITCHFINDER GENERAL (1968) plus short films. There is also a great line-up of guests expected to be in attendance including Caroline Munro (DRACULA A.D. 1972), Janina Faye (DRACULA, DAY OF THE TRIFFIDS), Madeline Smith (THE VAMPIRE LOVERS) and Norman J. Warren (INSEMINOID). Other guests expected to appear in association with The Misty Moon Film Society are Robin Askwith (HORROR HOSPITAL), and Judy Matheson (TWINS OF EVIL). There will also be dealer tables selling film memorabilia, DVDs, Blu-rays, stills, posters and more! DARKFEST 2 will be held on Saturday 24th November 2018 at 12pm (noon) - 11pm at the Genesis Cinema, 93-95 Mile End Rd, London E1 4UJ. One payment is received you will receive a signed, bespoke, individually-numbered ticket in the post. All films, guests and attractions are subject to change.